Lluís Gómez (banjo) and Joan Pau Cumellas (harmonica) lead this project dedicated to playing the traditional music of the Appalachian Mountains of the USA. The other band members are Miguel Talavera on guitar and dobro, Maribel Rivero on double-bass and other excellent musicians. All of them are specialists in bluegrass. This extremely demanding style is always very attractive for all lovers of the acoustic music. 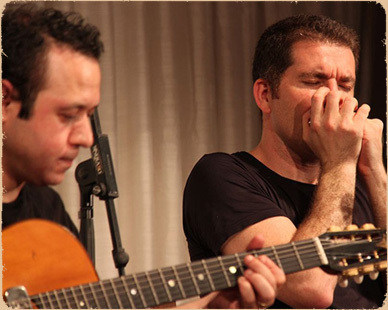 This blues duo is original fusion of sounds of harmonica and dobro guitar. These two musicians are well known for the excellent domain of their instruments and for a great expressiveness on the stage. 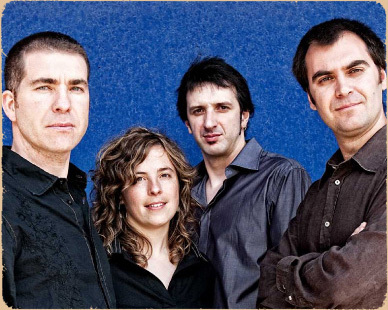 They have performed in numerous blues and jazz festivals in Spain and in the rest of Europe. They played too with artists of the highest international level. 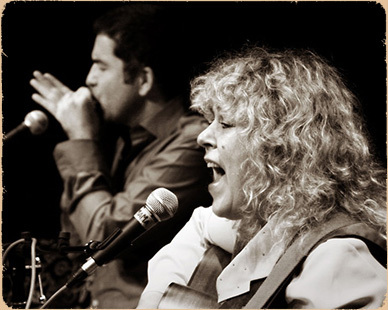 The favorite repertoire of these two singular artists is blues with touches of country, and other traditional music. Valentí Moya is a famous guitarist in the field of jazz manouche. His music is inspired by jazz master Django Reinhardt, but he´s also creative author of his own pieces. He recorded his excellent cd ‘Elefant Swing’ and many albums with other artist. 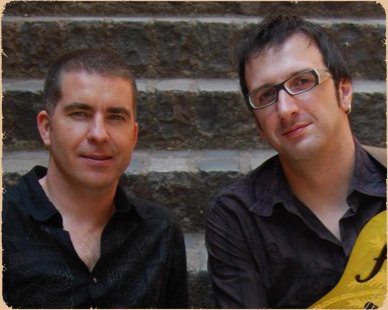 Valentine Moya invited Joan Pau Cumellas to collaborate with his trio. The sound of harmonica is a suggestive and original offer for lovers of traditional jazz. 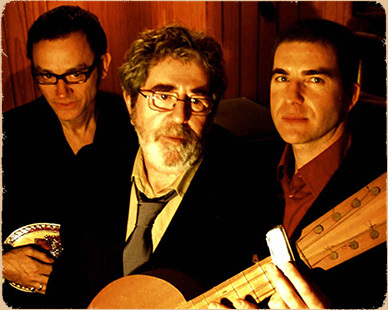 The popular songwriter Quico Pi de la Serra with guitarist Amadeu Casas and harmonica player Joan Pau Cumellas created the show ' QuicoLabora '. A project recovers the most emblematic songs that the singer has written throughout his career. Heart-breaking lyrics and music was created in difficult times but they are still actual in the present. The repertoire includes new pieces and arrangements where the author and his companions show theirs affection to the eternal blues. This duo makes tutorials for children about the history of the blues. The show starts from the beginnings of blues: the songs of workers, gospel and early blues performers. Talk about the historical and social situation related to the blues. Explain the connection of the blues with modern music styles. It´s the interactive show where every student can participate. It is a spectacle where musicians and dancers synchronize their arts in all aspects. A color of the dance show combined to the splendor of the music. The band presents different styles of the Irish dance, theirs instruments and theirs melodies. 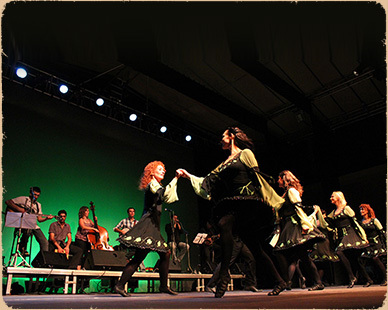 Polkas, Reels, Jigs and traditional Irish songs make an audience also became part of the show. This band plays an energetic Blues with touches of funk and jazz. Compositions for guitar of Andrew Martinez and for harmonica of Joan Pau Cumellas give a touch of modernity and freshness to Catalan blues. The album ‘Hard Driving ‘(2005) gives musicians a chance to play at numerous festivals and to be a reference for many followers. 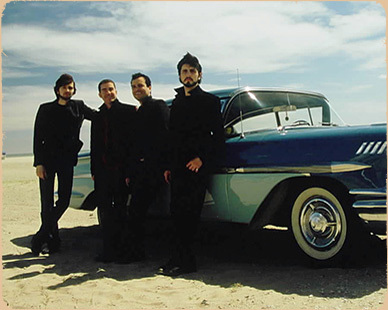 Their third cd, ' Barcelona-Memphis ', made stronger an innovative character of the group. This album was recorded in collaboration with exceptional American singer and keyboardist Charlie Wood, one of the world's icons of the Hammond B-3.